When does it appear ? Secondary lymphedemas are common in oncologic treatment, especially after lymph node dissection and radiotherapy. Cancers, whose treatments are commonly associated with lymphedema, include pelvic tumors (i.e., enlarged hysterectomies and prostatectomies), Hodgkin’s tumors, sarcoma and melanoma. Alternatively, lymphedema may also be caused by non-oncologic procedures such as saphenous vein removal, hernia repair, or thigh lifts, internal liposuctions. The lymphedema can appear immediately or many years after the surgery. Chronic infections can destroy all the remaining lymphatic collectors and elephantiasis can occur with skin thickening, folds , redness, fibrosis. Physiotherapy with manual drainages, bandages, compression garments is necessary, but sometimes inefficient. Lymphatic MRI after hysterectomy and adenomectomy, showing the absence of drainage in iliac and deep inguinal. The clinical evaluation, examination of the scars and the lymphatic MRI permit to evaluate the lack of drainage and the indication for autologous lymph nodes transplantation. Wedge excisions in elephantiasis are sometimes needed to avoid mycosis in the deep folds, and to allow bandaging. Free nodes transplantation are done the same day. The reimplantation of some nodes to reestablish the connections between the remaining nodes and chains can improve the drainage of the limb. Because healthy nodes contain VGEFc, a natural lymphatic growing hormone, they promote the development of new channels. 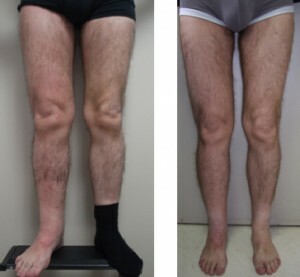 For the lower leg, the results are really correlated to the duration of the lymphedema, the fibrosis and, of course, the bilateral defect of the iliac lymphatic chains. 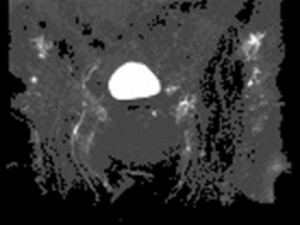 The lymphatic MRI shows new lymphatic pathways normalization of the lymphatic pathways in moderated cases. In long term lymphedema, 1 year after LNT, transformation in lipedema can occur. This lymphedema is 10 years old and appeared after an enlarged hysterectomy. Results are 2 years after lymph nodes transplantation. This lymphedema appeared after a total hysterectomy and adenectomy. Results are 2 years after ALNT. The following results are 2 years after 2 ALNT, in the inguinal and knee regions, for a lymphedema resulting from treatment for melanoma, having had that lymphedema resisting to all physiotherapic treatments for 12years. A selective external liposculpture can remove the « entrapped » fat and improve the esthetic results. The fat macromolecules are carried by the lymphatic vessels. In case of hypotrophy or lesions of these channels, the triglycerides do not circulate anymore and the fat stays in the limb.